Are you tired of salted caramel yet? Me either. Bacon everything I think I’m done with (though bacon caramel corn is always awesome). And I may be over quinoa, despite never having had it. But salted caramel still rocks my socks. This month it’s my turn to share snack duty for our home school parents group meeting. And since it’s also peak baking season, my thoughts turned to cookies. 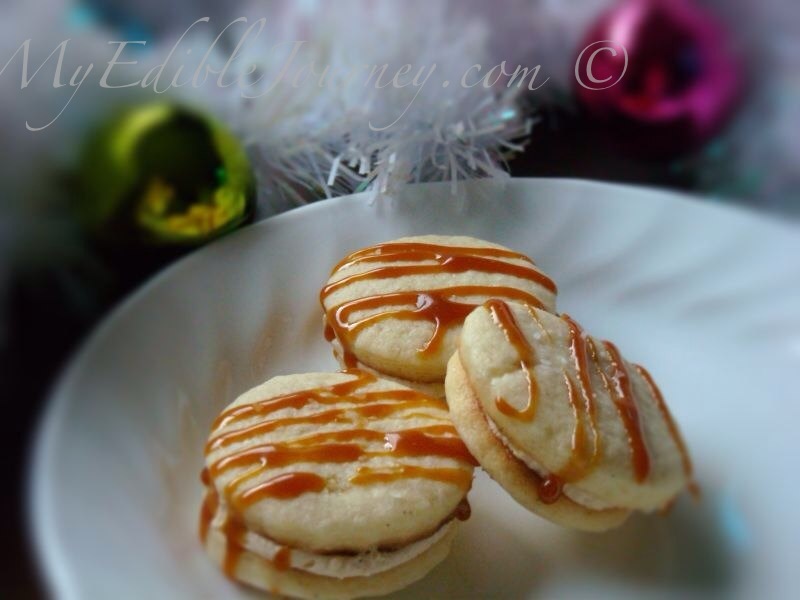 I’d seen a recipe for shortbread thumbprints filled with salted caramel, and decided to make them. The recipe claimed a yield of 45, which would be plenty. I really should have known better. The resulting crumbly shortbread dough did not lend itself readily to thumbprint cookies, and it certainly did not make any more than a mere two dozen. Admitting defeat, I bagged them up (why waste shortbread, especially during Christmas baking season) and went about the rest of the weekend, baking bread, watching snow fall (soooo happy! ), and making a birthday cake for hubby and our son. 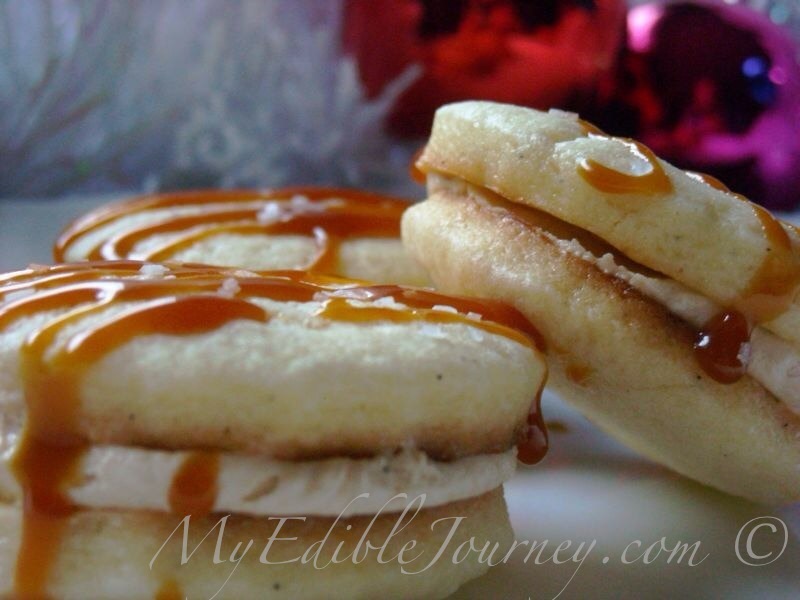 Salted caramel must have still been on my mind, because as I considered my options this morning, I settled upon trying to figure out how to whip caramel into a filling to sandwich between two vanilla bean sugar cookies. I wasn’t completely successful. My caramel seized up a little upon hitting the butter/sugar mixture. But I know what I did wrong. My caramel was too tight. A more sauce-like consistency would have yielded better results. I suggest this recipe from Chef Michael Smith. It’s for butterscotch. Just omit the vanilla. The cookies still turned out just fine. Little bites, flecked with vanilla seeds, sandwiching a creamy, slightly salty filling, also flecked with vanilla seeds. I drizzled the top with some of the remaining caramel sauce I’d made from this recipe, which I rewarmed to make it spoonable. Then I sprinkled all of the cookies with a little coarse salt. Salted caramel filling. This would be great on chocolate cupcakes. For the cookies – In a large bowl or stand mixer, cream butter and sugar together, then beat in the eggs and vanilla. Mix in the flour, baking powder and salt and mix to form a ball. Wrap the dough in plastic and pop it into the fridge for an hour or so. Preheat the oven to 375F. Roll out the dough to about 1/4″ thick on a board dusted with icing sugar (it doesn’t dry out the dough like flour can). Cut into desired shapes (I used a round cutter) and place on a parchment lined cookie sheet. Bake for 8-10 minutes, until the bottoms are browned. Cool on racks. For the filling – Beat together the butter and 1 cup of icing sugar until fluffy. Add the vanilla, salt and the cooled (but not chilled) caramel sauce. Continue to beat, adding more icing sugar if it’s too thin. Spread the filling on the bottom of a cooled cookie and sandwich it gently between another. When they’re all filled, drizzle them with a tighter caramel like in the second link above and sprinkle with coarse salt, if desired. 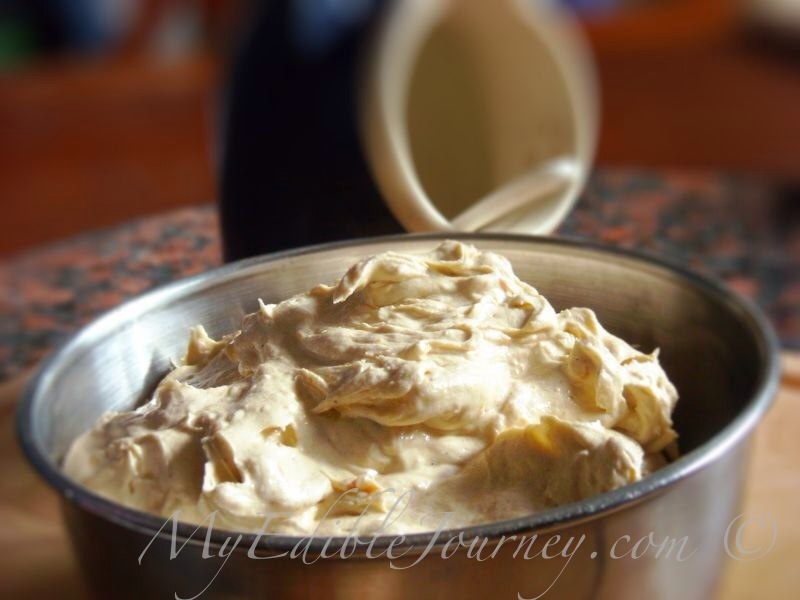 This entry was posted in Christmas, Cookies, Desserts and tagged butterscotch, caramel, Christmas, cookie, salted, sandwich on November 26, 2012 by Mama B. They look and sound amazing. I’ve had a salted caramel “problem” for years. Just can’t say no! LOL. Is it wrong that I wondered how the filling would be with a little crumbled bacon in it as the salt component? I’m on your side – can never get enough of salted caramel! I’m not tired of salted caramel, either! These guys look great!